The Marpo VMX Rope Trainer is a multi-mode rope trainer with three exercise modes - vertical pull, diagonal pull and horizontal pull. Each mode delivers unparalleled variety of strength and cardio exercises that target your entire body. Users can easily switch between modes with a simple and safe one-step carriage move. The VMX Rope Trainer features multi-mode adjustment for vertical, diagonal, horizontal and reverse pull. The easy-to-adjust sliding carriage allows for increased versatility for strength, cardio and functional training. The ability to alternate rope heights, grips and pull directions makes the VMX Rope Trainer the ultimate functional training tool. The Marpo VMX Rope Trainer is a Multi-Mode model that simulates actual rope climbing. The levitating seat moves with the user for instant feedback and a true climbing experience that engages the entire core, back, arms and grip. The Multi-Mode offsets body weight to allow those of all fitness levels to benefit from this uniquely effective exercise. Features a quick-release seat to allow for lower body, standing exercises and wheelchair accessibility. The Marpo VMX Rope Trainer delivers an exceptional strength and cardio conditioning workout that is as intense as it is safe. 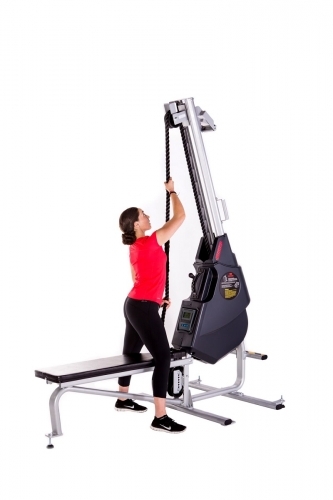 The Marpo VMX Rope Trainer offers a wide variety of exercises that target user's entire body. It allows users to exercise sitting or kneeling on the seat, or removing the seat altogether (with the quick-release feature) and exercising from a standing position or from a wheelchair. The Marpo VMX Rope Trainer can also be used in reverse, i.e. pulling the rope up instead of pulling down. The Marpo VMX Rope Trainer will allow you to devise a desired workout program for a general cardio, athletic training, strength training, power training and endurance/circuit training. The Marpo VMX Rope Trainer is a weight-assisted model that simulates actual rope climbing. The levitating seat moves with the user for instant feedback and a true climbing experience that engages the entire core, back, arms and grip. The weight-assist offsets body weight to allow those of all fitness levels to benefit from this uniquely effective exercise. Features a quick-release seat to allow for lower body, standing exercises and wheelchair accessibility. The Marpo VMX Rope Trainer delivers an exceptional strength and cardio conditioning workout that is as intense as it is safe.The Marpo VMX Rope Trainer offers a wide variety of exercises that target user's entire body. It allows users to exercise sitting or kneeling on the seat, or removing the seat altogether (with the quick-release feature) and exercising from a standing position or from a wheelchair. The Marpo VMX Rope Trainer can also be used in reverse, i.e. pulling the rope up instead of pulling down.Check out the Marpo VMX Rope Trainer and take a look at the future of mainstream conditioning. The benefits of using the Marpo VMX Rope Trainer are no longer the exclusive province of elite athletes. Now, safe and effective rope-pulling exercise is available to athletes, students, fitness enthusiasts, and even for injury-rehabilitation purposes. No need to worry about the risks and inconvenience of hanging rope from the ceiling. The seat offers added stability and safety, and it is removable for wheelchair-accessibility. Intelligent resistance™ adjusts to the needs of users of all fitness levels. The Viper, for those who are not familiar, is a unique piece of equipment that simulates rope climbing. The Viper happens to be available in three distinct models – V250 weight-assisted, VMX multi-mode and the VLT compact – which is the model I have at my facility. Each model allows for seven different levels of resistance, ranging from one (1) being the easiest to seven (7) which is the most challenging. Its comfortable, 1 ¼” diameter rope operates on an “endless loop” and is designed to allow for bi-directional work. This bi-directional feature is one of the many aspects that make the Viper so flexible in its many uses. 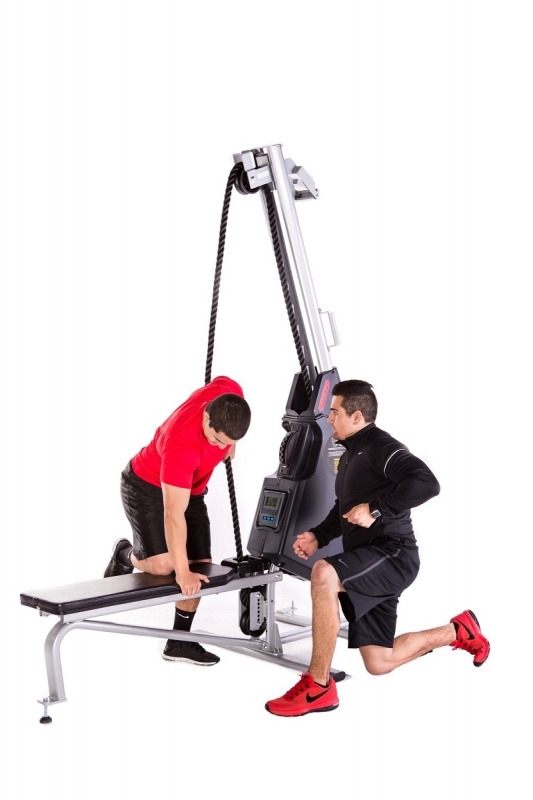 The Marpo VMX Rope Trainer can be utilized to emphasize strength, cardiovascular/cardiorespiratory fitness or both. It can also be used for rehabilitation work – especially for the shoulder area and arms - and can also be valuable in preventing injury. The Viper does not discriminate against an individual’s level of strength, conditioning or physical contraindications. Because of its capacity to allow for multiple plains of exercise and the various resistance levels, I can comfortably state that most anyone – young or old - can utilize the Viper Marpo VMX Rope Trainer in some capacity. 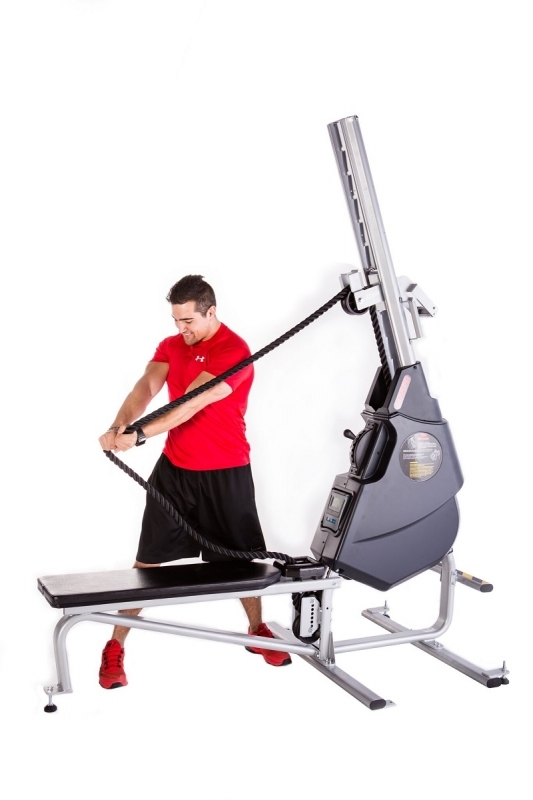 Check out the Marpo VMX Rope Trainer and take a look at the future of mainstream conditioning. If you're looking to rev-up your fitness program then call 1-800-875-9145 and talk with one of our fitness advisors about the Marpo VMX Rope Trainer. Order your Marpo VMX Rope Trainer from FitnessZone.com today! and get in the best shape of your life. Vertical, Diagonal, Horizontal rope orientations. 50 - 60% of maximum heart rate: The easiest zone and probably the best zone for people just starting a fitness program. It can also be used as a warm up for more serious exercisers. This zone has been shown to help decrease body fat, blood pressure and cholesterol. It also decreases the risk of degenerative diseases and has a low risk of injury. 85% of calories burned in this zone are fats! 60 - 70% of maximum heart rate: This zone provides the same benefits as the healthy heart zone, but is more Anaerobic and burns more total calories. The percent of fat calories is still 85%. Moderate (Aerobic Endurance Training) 70 - 80% of maximum heart rate: This zone will improve your cardiovascular and respiratory system AND increase the size and strength of your heart. This is the preferred zone if you are training for an endurance event. More calories are burned with 50% from fat. 70 - 80% of maximum heart rate: This zone will improve your cardiovascular and respiratory system and increase the size and strength of your heart. This is the preferred zone if you are training for an endurance event. More calories are burned with 50% from fat. 80 - 90% of maximum heart rate: Benefits of this zone include an improved VO2 maximum (the highest amount of oxygen one can consume during exercise) and thus an improved cardiorespiratory system, and a higher lactate tolerance ability which means your endurance will improve and you'll be able to fight fatigue better. This is a high intensity zone burning more calories, 15 % from fat. 90 - 100% of maximum heart rate: Although this zone burns the highest number of calories, it is very anaerobic. Most people can only stay in this zone for short periods. You should only train in this zone if you are in very good shape and have been cleared by a physician to do so. Order your Marpo VMX Rope Trainer from FitnessZone.com today! My personal best on this machine is 99 minutes, Level 5 and 15, 200 feet. The ONLY reason I have not gone longer is the indicator only goes to 99 minutes. I have pictures to prove it.